This was the first strange flavour I found. I happened to wander into a supermarket in Kyoto and found a bag full of these. That’s more like it! A bag full! 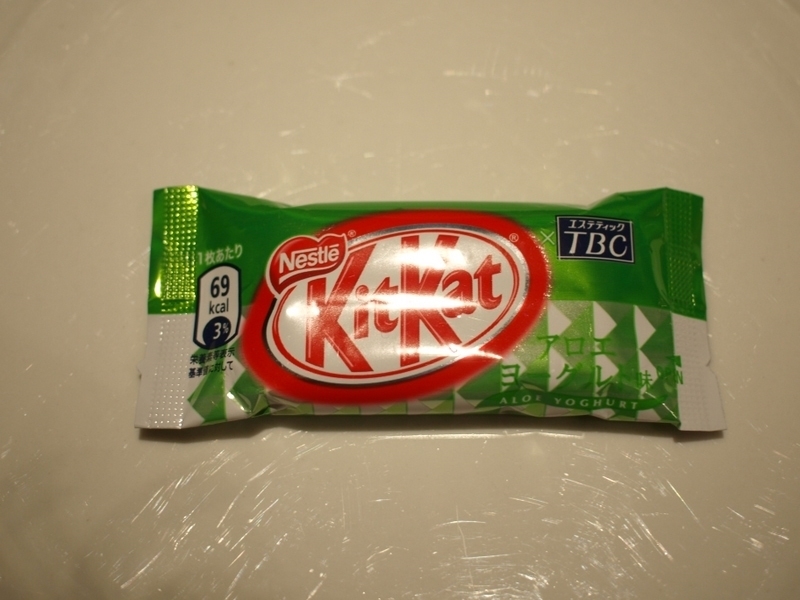 On the wrapper it has the initials TBC which I found out later from Ayako was a cosmetics brand. 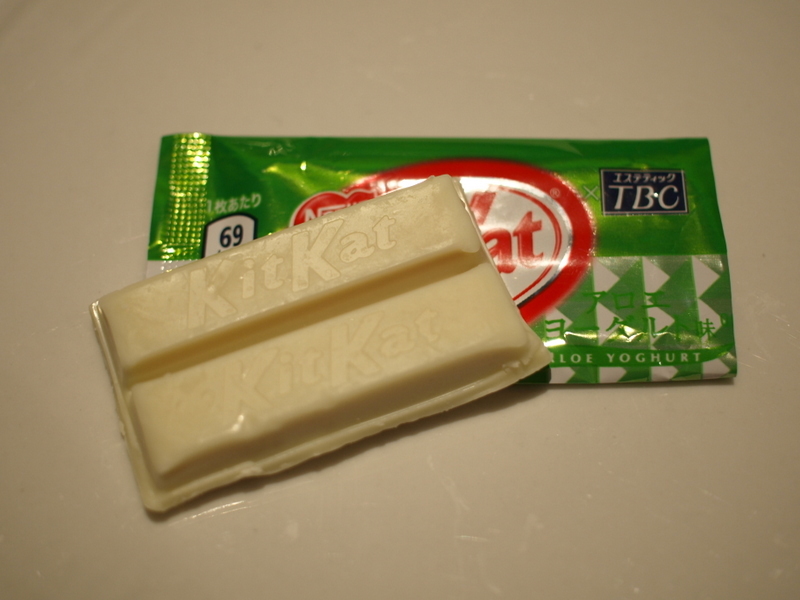 Kit Kats made in conjunction with a cosmetics brand? Hhhmmm. But I have had aloe before… aloe drinks are not uncommon, and I have drunk some with chunky bits. So while I know the idea of eating aloe would be strange, I knew kinda what I was in for. But I guess it is still a strange proposition in a way. 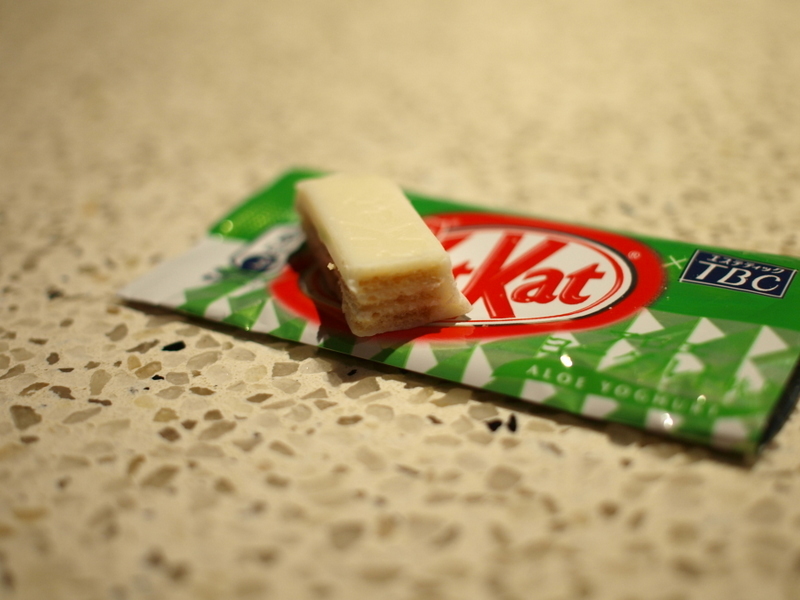 Yet another white chocolate based Kit Kat. I can’t imagine aloe in normal chocolate so I was thankful for that. You can see the colour is just pretty white. It has a fair off white colour getting close to creamy. Eating it I get the hint of yoghurt, but it is the aloe that jumps right out. It is definitely the dominant taste. And again, while I know aloe taste, I can’t say this was that awesome. I didn’t not like it, but it was pretty sweet. And boy, the aloe taste hangs around for ages. So much so that I can’t say I was the enamoured with these in the end. I didn’t mind while I was eating it, but the aloe taste lingered too long for my liking. Bummer I found a whole packet of these and not some other flavours. Oh well. Any wacky flavour is OK by me.